The fallout from the Sky News debacle of last week has been an interesting one to watch, not least because it highlights once again how far away Australia is from unpacking its structural racism. 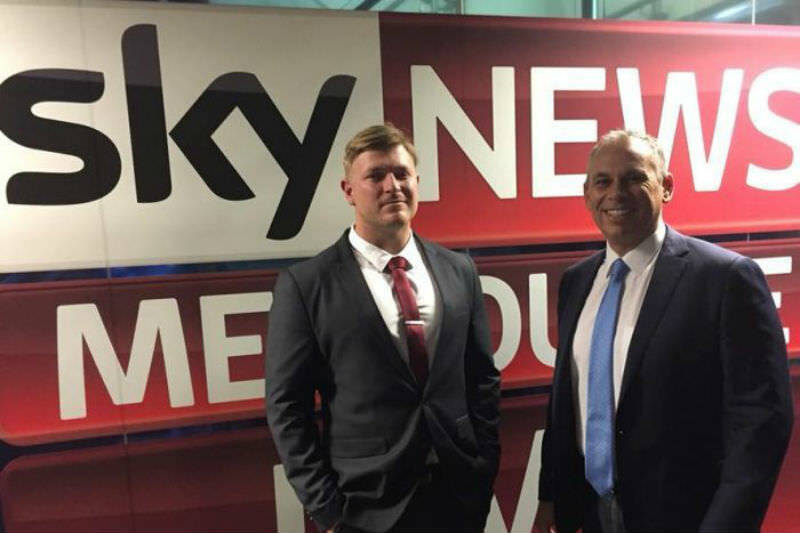 For those who didn't catch it, last Sunday night, Sky News chose to conduct an interview with a noted fascist and vocal figure in the Far Right movement in Australia, Blair Cottrell. Not only has Cottrell described himself as a 'fascist' in a now infamous video of him and a few of his brethren abusing a street performer following their ill-fated 'flag march' back in June, but he's also called for pictures of Hitler to be hung in classrooms across the country. A delightful character who has been continually front and centre at Far Right rallies and has a noted criminal record including stalking and arson. This was who Sky News felt would make a good interviewee on the Adam Giles Show. He was engaged by news director Greg Byrnes and then interviewed by Giles himself. The interview was a warm and collaborative one where Giles quizzed Cottrell on whether he felt he spoke for 'ordinary Australians' then engaged in a nice bout of race-baiting over the alleged 'African gangs' crisis Melbourne has. It was an appalling and, frankly, embarrassing show from the 24 hour news network. The fact that Giles — both the former Chief Minister of the Northern Territory and an Aboriginal man — felt compelled to collaborate with a fascist figure on air raises serious questions for me about just how far right an Aboriginal person looking to climb to the upper echelons of the Liberal Party must aim to be. Though given this was a man who frequently sold Aboriginal people out and ignored reports of brutality in youth detention while in power, and then when challenged for leadership, dug his heels in with a born-to-rule entitlement which would make any blue tie proud, we can safely say Giles is definitely no 'wet'. Credit where it is due though: when the controversy hit, Sky News acted swiftly. Indeed, they have ended up acting with more integrity than often-derided-as-lefty ABC did who have also played host to Cottrell and his harmful views. Sure, former minister Craig Emerson had to tender his resignation and sponsorship dollars had to be lost before they got the picture, but when they did, they moved on it. Byrnes issued a statement of wrongdoing on behalf of the station, Giles' show was suspended and Cottrell has been banned from appearing on Sky News again. The problem with all this is that unfortunately, I don't think it will solve anything. As Jack Latimore pointed out last week, banning one racist commentator does almost nothing to address the deep undercurrent of racism which exists in this country — a country which was founded on the erasure of a people — and the role the media plays to fuel the racist status quo. Cottrell is just a figurehead, performing a role not unlike that Pauline Hanson has played within the political field over two decades. People in this country can just point at them and say 'they're the real racists', then when these figures are dealt repercussions for their views, many end up thinking that that's the job done. "The Sky News mea culpa therefore gives me no faith at all. For their action to have meaning, it would require a massive cultural shift — not just on their account but within all of the mainstream media." Yet look at Hanson. Over the years her despicable views, her racism and xenophobia, not only got absorbed by the federal Liberal Party and turned into policy, but the media normalised all of it. 'Swamped by Asians' merely shifted to targeting Muslims then Africans. What's worse is that the Labor Party then adopted similar 'stop the boats' election campaigns in a bid to win back votes of the disaffected. They had an opportunity to educate and embrace and instead, they retreated into White Australia Policy security. If this goes on, what guarantees have we got that the views of Cottrell also won't be normalised by politics and the media? Certainly he'd like this to be the case. Sky News may sanction him but as mentioned, the ABC has previously welcomed him with open arms. This is after years of the media — including the conservative Sky News — painting the views of Cottrell and his brethren (because let's face it: they are mainly men who are also white) as somewhat neutral yet different. As the concerns of 'ordinary mums and dads'. As just one side of the coin with anti-racist activists as being the other, therefore framing anti-racism as an extremist ideology and not what should be a given in a civilised society. For far too long, the media has been complicit in maintaining the very conditions which allow the likes of Cottrell and Hanson to become 'figures'. They will fuel history wars, demonise the migrant communities, target Aboriginal activists, objectify and ridicule women while ensuring at the end of the day, the Murdochs and Packers of the world still have hefty pay cheques. Meanwhile hate crimes go unreported, unidentified Aboriginal women continue to be murdered and the general public remains ignorant yet afraid. The Sky News mea culpa therefore gives me no faith at all. For their action to have meaning, it would require a massive cultural shift — not just on their account but within all of the mainstream media — from demonisation of vulnerable groups of people, to education and proper news reporting. And right now, there is no evidence this shift is ever going to occur. We don't have to look far to find racism, including racism against our indigenous people and those who seek asylum here. Please watch the documentary 'Chasing Asylum' which includes footage secretly filmed on Australia's off-shore detention centres at Nauru and Manus Island. Some of our politicinans have tried to put these desperate people in these off-shore 'hell-holes' thinking they will be out of sight and out of mind. The above documentary gives insights into the terrible cruelty inflicted on these desperate people by both sides of the House. What a far cry from the time of Malcolm Fraser who welcomed 70 000 Vietnamese to Australia after the end of the Vietnam War, in which Australia participated. He flew them here after coming to an arrangement with the Malaysian Government. Please engage in political advocacy for the remaining detainees. They need to be brought to Australia as soon as possible. It is a false argument that this will start up a flood of boat people. Any boats that start up will be turned back. A more humane approach would be to come to an arrangement with Indonesia or Malaysia and fly the most desperate refugees to Australia. A queue could be formed and anyone who attempted to come here by boat could be put at the end of the queue. Thanks you for this fine article Celeste, and also for your comments Grant. I recommend the book "Journey into Darkness" by Winton Higgins. The descent of high European cultures into fascism not so very long ago is a warning that it can happen as insidiously anywhere. Please keep reminding us, Celeste, of just how easily racism grows in society, slowly covering all, like lichen growing on a hard rock. Grant's comment is apt, placing our cruel and inhuman treatment of asylum seekers and even acknowledged refugees, in the context of societal racism. Slowly, I'm starting to understand how the great majority of German citizens during the second world war felt powerless to assist their Jewish compatriots. Even in today's peaceful Australia, even noting the large number of Australians objecting to the bi-partisan policy and practice of indefinite detention of asylum seekers who come by boat, we find ourselves quite powerless to stop this cruel treatment wrought by contractors, paid from our taxes, authorised by both sides of our Parliament. When will we ever learn? Dear Celeste, I very much sympathise with the motives behind your piece, except for the paragraph on Adam Giles. If Giles is wrong, and he speaks as an Indigenous person, it begs the question as to what entitles some Aborigines to speak and others to be denied a podium. As a person of colour myself, I would much rather we all respected the open forums that accompany free speech and democracy than castigate the media for a lack of self-censorship. In my view, right-wing spokespersons and politicians, like Hanson, Cottrell and Fraser Anning (like his tongue-tied Party boss, Bob Katter) should be publicly-sponsored to tour the country as publicity agents for just how ignorant, inarticulate, insensitive and crass some political views can be. Katter, in particular, offers the kind of crude entertainment value, in terms of his gobbledygook, that not even Sir Joh Bjelke-Peterson could muster. By their own mouths are they condemned!